Today is posting day for Secret Recipe Club‘s Group C! Secret Recipe Club is a group of rabid food bloggers that are kept in line by some truly marvelous hosts: Camilla, Jane, Sarah, and the fabulous Group C host, Debbi. Each month the membership receives a “secret pal” and must choose something from the assigned site to make and post. My “secret pals” for this month were Serena and Deanna (both registered dietitians) who tag team Teaspoon of Spice. There is so much information on their site that it was overwhelming at times, but I found an extremely intriguing recipe: Dandelion Jelly. I would love to take a foraging class some day and learn about all the edibles I can find in our yard. We don’t spray or use any pre-emergents so everything is fair game and weedy and wild. We always have a good crop of dandelions growing and the bees seem to love them. 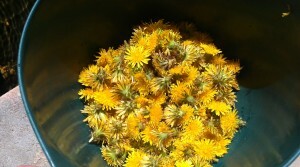 Before The Hubs mowed the yard last weekend, I raced out and picked a bowl full of dandelion flowers. 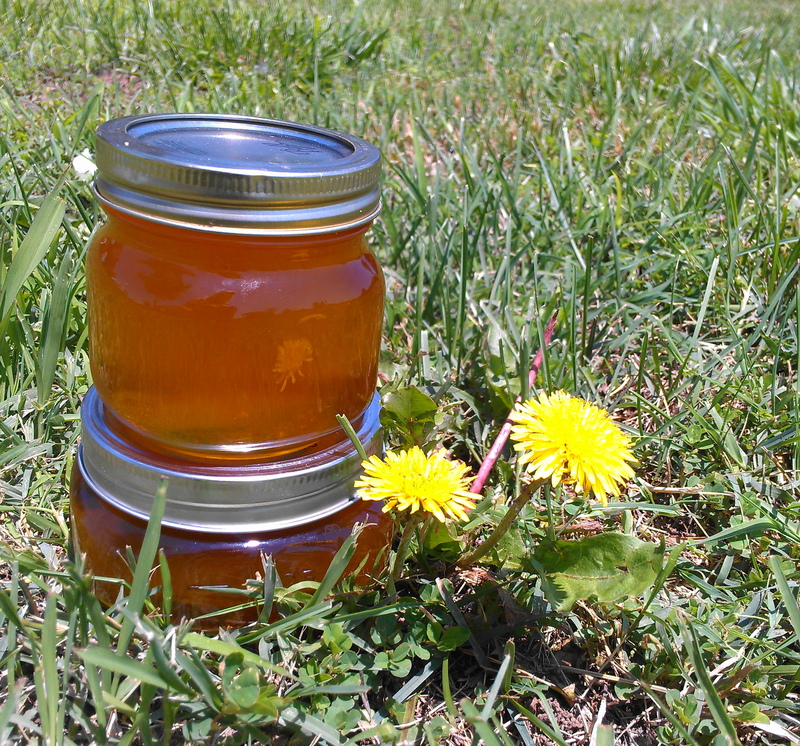 This Dandelion Jelly tastes EXACTLY like honey. 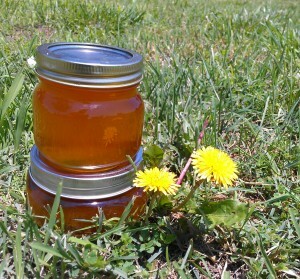 After all, bees take nectar from dandelions to make honey – in this recipe, you just steep out nectar, add sugar, a little lemon and you’ve got Dandelion Jelly. I concur. It does taste and look exactly like honey, only with the consistency of jelly. I had to eat it as soon as it cooled. In a small to medium saucepan, bring water to a boil. Add 3/4 cup blossoms; turn down to low and cook for 10 minutes. Turn off water and steep for about 15-20 minutes. Using a fine mesh strainer, strain out and gently push on blossoms to remove some of the water. Add this dandelion-steeped water back to saucepan and bring to a boil again. Divide the petals into to equal parts. Add remaining blossoms; simmer for 10 minutes and strain out blossoms, pressing to remove water. Measure steeping liquid to 1 1/2 cups; add sugar, pectin, lemon juice and food coloring and bring to a boil, stirring until sugar dissolves. Boil for 1 minute, then skim off foam with a metal spoon. 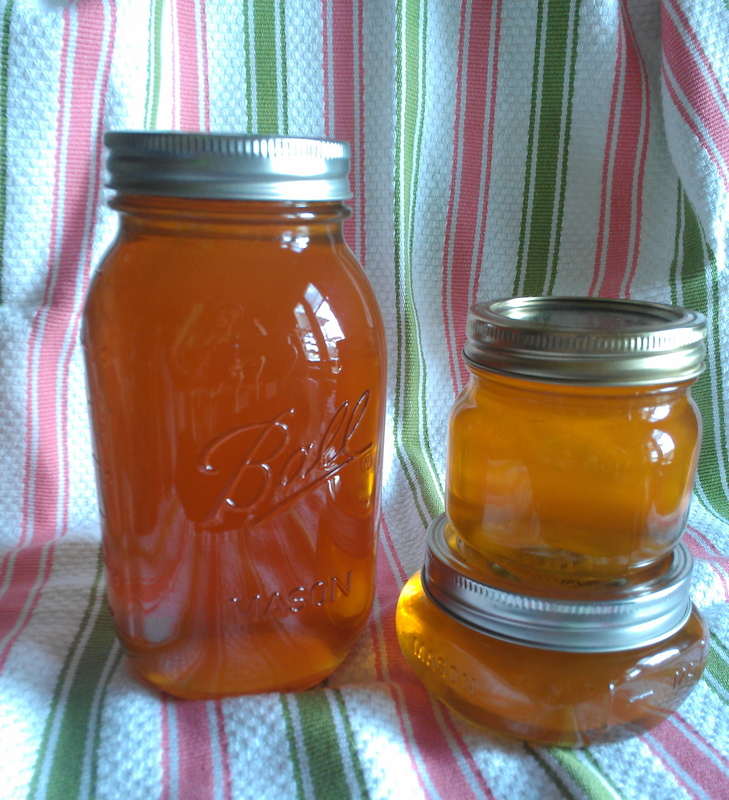 Pour into hot sterilized half-pint jars leaving 1/4-inch head-space and store in the refrigerator – or process according to canner manufacturer’s instructions. I used fresh lemon juice but Serena says to use bottled so the acidity factor will be consistent. I was determined not to add the food coloring, but the color was a dingy greenish-yellow color. It needed the a few drops of yellow. If you told people you had found a way to jelly honey, they would never know the difference. I can’t wait to fool the nephews when they visit next month. I will have them guess what kind of jelly this is as they eat their breakfast toast. Thanks, Serena and Teaspoon of Spice, for a great foraging recipe. 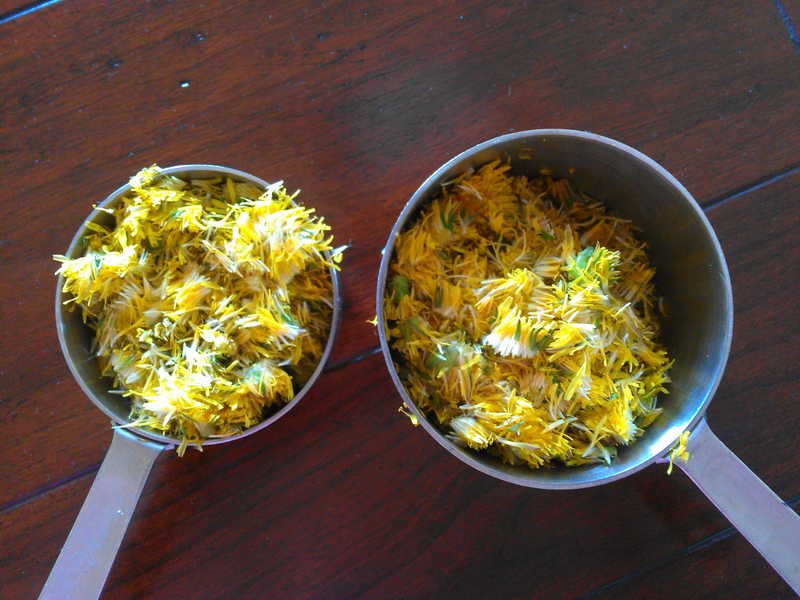 I can see, perhaps, some dandelion wine in our future. Can you tell the difference? These are two of my jellies next to some fresh blackberry/blueberry honey from a local farm. SRC Note: April is stepping down as owner of SRC and passing the reins to Sarah from Fantastical Sharing of Recipes! April, thank you so much for your leadership and I wish you all the best in your travels! You forgot to link up again…guess what I’m doing next? 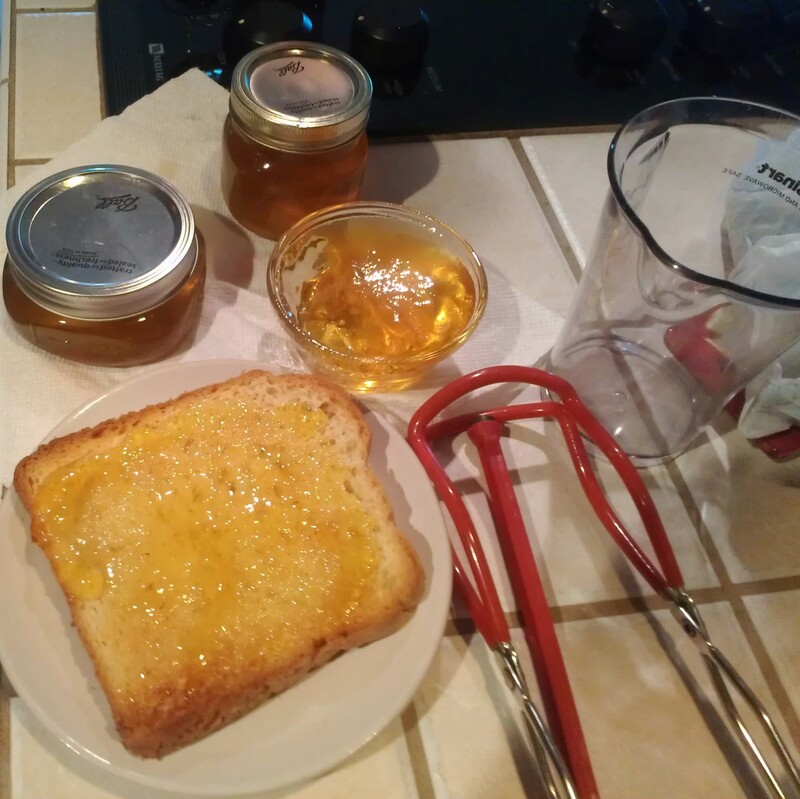 😀 This is the coolest recipe ever, and I’m so intrigued that it tastes like honey! I guess I imagined it would have a more floral taste. Very cool! LOL I don’t sleep. 😉 I actually stay up past midnight so I’m awake to do it right when the linky opens, and then I’m up around 6:30 am again. Wheeee! Life as a mom. Jelly made with dandelion…this sounds really intriguing! I was intrigued but color me amazed now. I am a true believer in foraging for weeds! Louise, you must try this stuff. The petal pulling is a bit tedious and that is why I made a half batch. Now, I wish I had made a full one. There will always be more dandelions…. Wow, that looks amazing. I was planning on making a dandelion green salad so now I know what I can do with the flowers. Love this idea. And, I bet you have a helper that can pull all the petals off. This may possibly be the most original SRC post I have seen to date! Thanks, Jamie. I am so glad I found this recipe. OMY I love this look absolutely beautiful!! I’ve never heard of this but it sounds nad looks wonderful! wow. that is eerie. I hope you make it now. Our dandelions are pretty much done here but I’ve pinned it for next year…goodness knows there’s never a shortage of dandelions! Can’t wait to to try it! I don’t think out dandelions are ever done! This is a must make for the summer! If my husband wont mow the yard for a couple of weeks, I’ll have plenty of dandelions. I love that it tastes like honey. You got my attention with that! Thanks! Yep, get out there before he mows! I love honey and this is a perfect idea Debra! Indeed they look almost identical! I would love to do a blindfolded taste test. That is so beautiful! 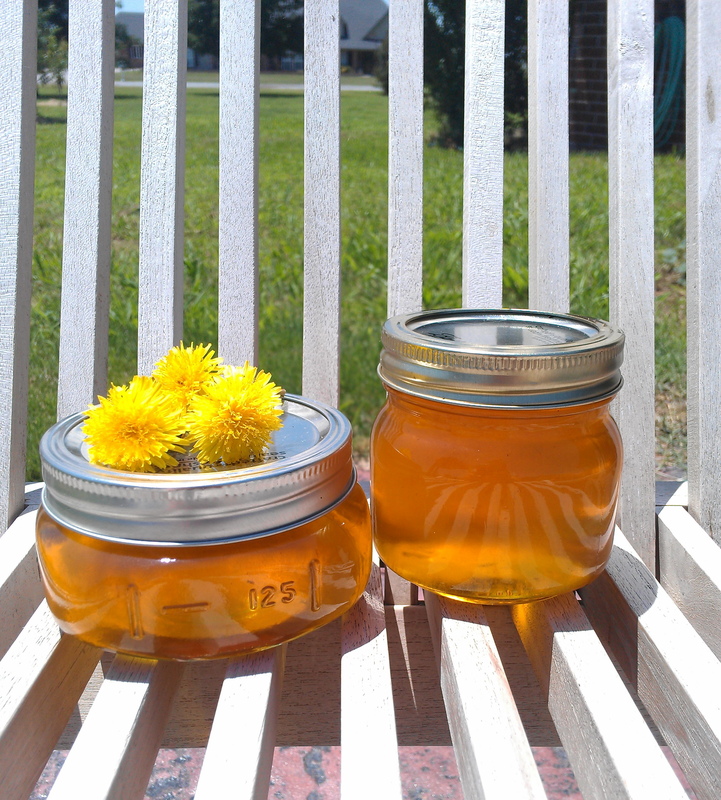 I make a lemon honey jelly for my daughter although I would love to try this one……….I will have to wait till next year though because the hubs has gotten rid of all the dandelions in the yard this year! Have you posted that recipe? I don’t think I have – but that’s something I need to make and do – Holli has been wanting some more but I haven’t had time……..I guess now I do! I hope you do make it and share with us. How interesting! I have heard of Dandelion wine but not jelly. How cool. And it looks so wonderfully clear. That is all I had heard of, too. So glad I found this recipe. This is exactly the kind of thing I look for. Looking forward to the dandelion wine recipe soon. I was surprised how clear it was. Clear like honey…..
I’m FINALLY getting around to comment and so cool that you make Serena’s Dandelion Jelly (it’s still on my to do list 🙂 Your final product looks gorgeous and I’d love to hear if you’ve fooled others by saying is a honey jelly 🙂 Awesome post!! No worries….busy times. I was SO glad to have found this recipe! Thank you guys and your site is great. I will be back.